Christ following men need to know who they are, and the Bible tells us–we are sons, leaders and warriors. While our core identity is as sons of God because of Jesus and His cross, we are also leaders of our families and therefore workers and providers as well. 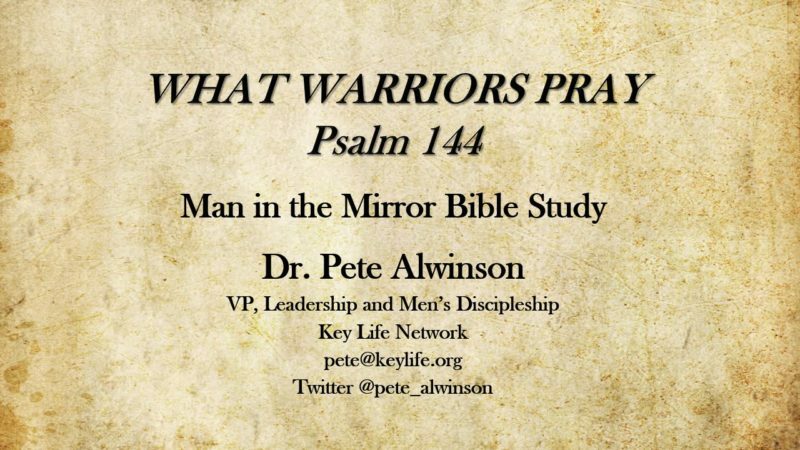 What does it mean for us to be warriors, how does the Father build warriors today, and what do warriors pray and why? Good morning! Lucas, thank you very much! Good to be with you guys here, bright and early. Pat Morley called me up the other day and said I have to be out of town, it’s short notice, would you fill in? I said what an honor it would be to do that, so pray for Pat as he’s out of town and he’ll be back soon no doubt. He said I could talk on whatever I wanted to talk about, so I thought we’d just throw it open and have a community discussion here today… Not really! I’m a preacher. You give a preacher an opportunity to talk, he’s going to talk! But before we do get into God’s word, let’s pray as we get started today. Father, thank you for your goodness to us, thank you that you have called this many men, these kinds of men to be here this morning, in this place. We thank you so much for Man in the Mirror, thank you for what you’re doing in each of these guy’s lives, and their families, and their churches. Lord, we just commit ourselves to you right now, we ask that you would speak. We believe that you are a sovereign God, you’re a gracious God, that you have a purpose for our being here today and we pray that you would make this worth our while. Father, be with Pat in his travels. Use him as you always have in a mighty way, and we commit our time to you now as we pray these things in the strong name of our risen savior, Jesus Christ, amen! Well it is good to be with you and like I said, Pat said I could talk on anything I wanted so we’re going to do a survey, Genesis to Revelation… I’m not that dumb! I want to talk to you about a Psalm, one that’s been powerful to me and increasingly gained my thoughts, Psalm 144. It’s a warrior’s Psalm, and this Psalm really raises the issue of a part of manhood that I talk about a great deal, but that a lot of people struggle with, and that is that men are warriors. One of the problems with talking about manhood in America, and you know this no doubt, but one of the problems with talking about manhood in America today is that many American men struggle to even understand what it means to be a man. So as I have studied scriptures, I’ve come to the conclusion as I’ve looked at the roles and relationships that man is in is that I believe we could say that a man has three key roles, and I’ve talked to you about these in the past. Some of you may not remember, but some of you may, that as we look at scripture there are three roles for men. We are sons, we are leaders, and we are warriors, and I believe that those are three archetypes, not in a psychological sense, but in a spiritual sense that we are born with. Adam was born as a creature made in the image of God, right? That’s relational. Adam was a creature, he’s an image bearer, but preeminently, on a personal level, he’s a son! And in Jesus Christ, we are made sons again. So we’re sons, and that really relates to our being. We’re human beings and that identity is who we are, that will never change, by the way, throughout all your life. Once you’re a Christian following Christ, you are a son of the living God, and God is the ancient of days who can always put his hand on your shoulder and look at you, no matter how old you get, and say son. Son! Deeply rewarding to know that we’re sons! But then in our roles, we see that we’re also leaders. In the garden, God said to Adam, work it. He was the head of the human race, he was to lead his family, and he was to work, so as a leader we’re workers and providers too, right? But then we’re also warriors, because when it says to work the garden, he also says keep it. Keep it. And in the original Hebrew, there’s an idea wrapped up in that word keep that is a martial term, reflects to this idea of warrior. Guard the garden before sin entered into the world? Guys, can you talk to me about that? I don’t understand that except that there’s a warrior mentality wrapped up in that, that Adam was to be a warrior and we in fact are in those roles, but a lot of people today, a lot of Christian men, we might get the idea of being sons, we might get the idea of being leaders, but we struggle with the idea of being warriors. By the way I shared this with my guys at Key Life Men on Tuesday mornings. It was a news article, here’s the title: Woman stops gator attack with small Beretta pistol. It’s an article about how a woman killed a gator with a small pistol. It raises the question how? What caliber pistol would you trust in taking out a gator, for those of you who hunt gators you know. It’s a Beretta Jetfire pistol testimonial. She says while out walking along the edge of a bayou just below Houma, Louisiana with my soon to be ex-husband discussing property settlement and other divorce issues, we were surprised by a huge 12 foot alligator suddenly emerging from the murky water and charging at us with its jaws wide open. She must have been protecting her nest, because she was extremely aggressive! If I had not had my little Beretta Jetfire .25 Caliber pistol with me, I might not be here today! Just one shot to my estranged husband’s kneecap was all it took! The gator got him easily and I was able to escape by just walking away at a brisk pace. It’s one of the best pistols in my collection, plus the amount I saved in lawyer’s fees was more than worth the purchase price of the gun. I’m glad you laugh, because sometimes when you hear the anti-male agenda in America, you want to cry, you want to scream! But the reality is you’ve got to laugh, you’ve got to know God’s in charge in this whole thing. We Christian men are not anti-women, right? We’re not anti-women, we’re pro-women! In fact, if you were to see me yesterday! My daughter-in-law brought her two children over, both little girls, sixteen months and nine weeks, you guys would have been proud of me. I fed little Molly the bottle, I was tender. You would have been proud at my tenderness. But if you had walked in the room to do harm, you’d have seen another side. Just like I would have seen in you. We have got to understand that as men, we’re sons, because of the Gospel, that we’re leaders, but the warrior side is real and not to be underestimated. And in this Psalm that we’re going to look at briefly, David as the warrior prays. We’re not going to talk about everything that warriors do, but we are going to talk about what warriors pray, and I’m going to tell you up front, you see this on your outline if you’re following with me, I want you to see on your outline there that the reality is that this Psalm relates first and foremost to David as the king of Israel and his heirs that follow him, because what this Psalm is is that the Israelites sang this song and prayed this prayer in their worship, they’re saying God, as long as David is ruling well, and David’s descendants are ruling well, we will be blessed. And my fingers for battle. Who subdues people under me. His days are like a passing of shadow. Here we see first of all David in his prayer starting out with praise and what he’s doing is he’s praising the warrior maker. He’s praising God as the warrior maker. Exodus 15:3 says the Lord is a man of war, the Lord is his name. The Bible does in all of the attributes of God tell us that God is a warrior, you know that of course don’t you? And we see it Biblically speaking and historically that God himself is a warrior, it’s one of his characteristics, it’s on one of his attributes, one of his traits, and as a warrior it takes a warrior to build a warrior, right? Ever seen the movie Officer and a Gentleman? It takes a warrior to take someone who is not a warrior and develop them. You ever hear the stories of self-made men? I just love it when somebody says I’m a self-made man. I’ve been a pastor for too long, and I know that self-made men eventually self-destruct. It always happens, because they are reliant on themselves, not the God of the universe. David is telling us that God is his rock, it is the covenant making God who is strong and is our rock-like foundation, right gentlemen? You’re here today not because you know you got it all together, you’re here today because you know you don’t, and I don’t! And because God is our rock, we stand. We don’t stand because we’re strong! I love this, because then I don’t have to play a game. This doesn’t tell me that I have to go out and act like it. Of course, on Sunday morning we say how you doing? And everybody says fine, good, how are you? Because that’s not the place to talk about it. But the strategy ought to be this: How you doing? And if things haven’t been good, you might say to the guy hey can we talk after church? It’s been tough, I’m fighting a battle. See the cool thing about being a Christian and a man following Christ is that you don’t have to be the rock, because God’s the rock and David understood this. We’re weak, and he is strong and sometimes warriors go off into the corner and like their wounds, because we’re hurt. And the fact is God is our rock and we don’t have to play a game. Look how David praises God next. If you’ve ever seen the movie Saving Private Ryan, you’ve heard these words before on the lips of Private Jackson as he was in the bell tower, the scripture quoting sniper, just before the German tank swings its barrel up and blows him out of the bell tower. This is the third passage of scripture that he quotes: Blessed be the Lord, my rock, who trains my hands for war and my fingers for battle. That’s graphic isn’t it? I love that! He is my steadfast love, and my fortress, my stronghold and my shield. He in whom I take refuge, who subdues people under me. The Gospel makes warriors who are loved! Blessed be the Lord, my rock. He is my steadfast love. When was the last time you heard a warrior say that? David knew that God loved him unconditionally. Out in the fields, he knew that God had connected to him as he took care of his sheep. In the Gospel, we know that God loves us. You cannot look at the cross and think God doesn’t love me, and yet gentlemen, how many of us live our lives get up not really knowing, wondering does God really love us? Billy Graham once said the biggest problem among Christians is that they don’t have assurance of salvation! I think, related to that, is one of the biggest problems among Christian men that they don’t know that they are loved! David knew he was loved. Let me tell you this, the best warriors fight out of love, not out of anger. They fight because they are loved, and because they love, and because they love they fight for what’s important, and David could fight for God, for his people, because he was loved and in his heart he knew the warrior is strengthened when he knows he’s loved, and when he doesn’t know he’s loved he’s an insecure warrior. The Gospel of grace is so powerful because God says I love you. In U.S. Military fitness manual dated 1946, there are three levels of fitness given after WWII. They knew in the training for the war how difficult it was to keep guys fit for battle, so they came up with three levels. Technical fitness is knowing the skill, how to fight. How to use a bayonet, how to use a gun, the technical skill of fighting. Number two, there had to be mental and emotional fitness, the incentive and the desire to fight well. Number three, there needed to be the physical fitness, the strength and stamina to fight well, and I think David attributed all of this to God. When he said God trains his hands for war, I think he said God teaches me how to fight, physically, but he also taught him how to lead Israel, so how to fight against the enemies of Israel by learning to lead. Gentlemen, don’t we as men need to learn to lead our families well? There’s some technical skill involved in that. Learning to father well, learning to develop our marriages and all of those, that’s technical fitness there. I’ve been married 36 years, best 36 years of my wife’s life, I want you to know! But I am reading a book, Two Becoming One, in fact, I finished it the other day. It’s a great book on marriage. I still need to grow in marriage, I still need technical help, don’t you? The warrior needs technical fitness, he needs mental and emotional fitness, and he needs to be based out of that steadfast love and then he also needs physical fitness. By the way, when guys would come to me in my church and say hey Pete, I’m trying to lose some weight, I’d say great! I didn’t want guilt them, I knew they kind of needed to, but I said how do I respond to that? Good, Jesus will love you more if you lose some weight. No! What I settled on was this, good, I need you in the battle! I need you on the team! Physical fitness is important. It’s not the only thing, Paul said it was of little value compared to spiritual discipline, I know I understand that, but it keeps us in the battle! I used to stay in shape to try to keep up with my kids, now it’s keeping up with my grandkids. And don’t any of you call me grand pappy! I’m not happy with that, I’m still adjusting to being a grandpa, I’m insecure. But I want to fight for them, I want to stay up with them, and so David starts this… some of you are looking at the clock and saying wait a minute, we got a lot more to do. This was my longest point. What I want you to know is that David first of all starts his prayer by praising the warrior maker and God is a warrior maker with his sons. He makes us sons through Christ, establishes us as leaders and then calls us to be warriors, and there’s a great freedom in understanding that you’re a warrior, as the New Testament says. I love David’s balance between God’s sovereignty and man’s responsibility. He is a warrior isn’t he? But what does every warrior do before the battle gentlemen? He prays! Fight for me! Some of you have meetings today, and you don’t know how your business is going to turn out. You’re saying Lord, fight for me. Warriors, when they’re smart, human warriors are always saying God, fight for me. I can’t make this happen. When you go home and your wife says something like you know, we need to talk, and your stomach tightens into a concrete block, or your son or daughter call you up and say dad we got some issues, you know you got to gear up and move into it, and what do you pray? Lord, fight for me. Work, go ahead of me. Every Biblical warrior worth his salt does exactly what David does and prays that the ultimate warrior will help him. John Mason in his book An Enemy Called Average, nugget 38 says this: stop every day and look at the size of God. I love that! And in the Gospel, in the death, burial and resurrection of Jesus, what do we see gentlemen? We see the love of God but we see the size of God. Only an omnipotent, sovereign God could have done what Jesus did for us and the Gospel is related to this. I’m not saying gear up and be strong, I’m saying look at the size of God, because we face a lot of challenges. Mason also said if you don’t need miracles, you don’t need God. I need miracles every day, and I’m Presbyterian for crying out loud! I need miracles. He makes promises. The warrior makes promises, and what are the promises that he makes? He makes the promise that at the end of the day when the battle is over and he has come through that he’ll write a new song just for God about how God brought the victory. That’s how you go into battle! With a positive sense that God’s going to win, and we don’t always know how. But I love what David does as he gears up for battle. He says I’m going to write a song for you, God, as you pull this out. I may get hurt, but you’re in charge. The other day after our Key Life meeting, we had a stand up meeting with the table leaders and we always try to ask our guys what are you hearing from the men around your table? One of the guys said we have a guy at our table who I’m pretty sure has got PTSD, post-traumatic stress. He was a warrior, in the military, he’s got it. One of the pastors who leads one of our tables said you know I think pastors all have PTSD. I’ve been a pastor for a long time and I looked at him and I said you know I think you’re right. Guys, your pastors probably do find far more conflict in the ministry and the church than you ever thought, than they ever thought! What did General McArthur say? Old warriors never die, they just fade away. Kind of depressing. But the reality is at the end of battles, everybody is fatigued, and we need this positive sense that God is really in charge, that God is going to take the brokenness of the battles and turn it to good, and he promises actually to do that. That may not be the most flattering thing to tell your daughter today. Be careful when you use this at home! Providing all kinds of produce. 14 May our cattle be heavy with young. Suffering no mishaps nor failure in bearing. I love that! When you go into battle, you’re envisioning a God honoring future, that he would produce and David prays for that, keeps that in mind. This is an application for the Israelites. They prayed this as David and his descendants led well, the people would be blessed. This is true for Jesus, the ultimate descendant of David. As he leads well, we are blessed. Gentlemen, isn’t that true? Does Jesus still lead today? Absolutely! He governs his church through his word, the sacraments, through duly authorized leaders. He leads, he governs, he’s in charge, and he’s here. I will be with you always, even unto the end of the age and he’s delegated us the opportunity to fight. When a man understands that he is not only a son, but a leader and a warrior, it flicks a switch inside him, gets a little adrenalin going to fight well and to fight right as God defines it. That’s why Jesus comes to model how to fight. Ah! Look at Jesus and how he deals with the hypocrites, how he deals with the sinners. In Jesus, we learn how to fight and we learn how to envision that perfect future. Because of the cross, everything changed. The Gospel restores our dignity as sons, leaders, and warriors. Will you allow him to continue to build you into a warrior? Will we look at young men in our church and move into them, move into their lives and say I want to train you, I want to help you, I want to be a part of supporting you. You’ve got to take over, I’m getting old! Will we allow the Lord to give backbone to us where we don’t have it now, where we’re letting down, where we could sacrifice? Go through the trials that warriors go through, get wounded, get hurt, risk. Where are you at the point of ministry and where do you need to risk? In your marriage? Moving toward your kids? In business? Ministry? Where is Jesus calling you to be a warrior right now? I don’t know. Two quotes and then I’m done. David has helped me to see the reality that John Maxwell’s right. He says nobody remembers what you do at the beginning of your life, they only remember what you do at the end of your life. So finish well! I’ve been in Orlando 28 years. Many of you guys know me as a pastor, but the reality is at the end of my life, the only impact, the only thing you might remember me for and who cares if you do… As Pat Morley taught me a long time ago, structure your life based on whose going to be at your funeral. Thanks Pat, I needed that! But really they only remember what we do at the end of our lives, so finish well! Maxwell said that’s right, and that’s the warrior’s mentality, fighting until the end. Then there’s one other quote. He wasn’t a Christian. General George Patton. How many of you read the book Killing Patton? It’s worth reading. He says there’s only three major strategies for warfare: audacity, audacity, audacity. I’ll tell you, he’s not a believer, but I’ve not been able to get that quote out of my mind for weeks. I will be 60 this year, and I think it’s the spirit of God saying Pete, where are you going to be a little audacious for me? Audacious, audacious, audacious. Where are you going to risk? I think warriors do that. Not to gain God’s love, but because we have it. In Christ, we have it, and we’re free. Let’s pray! Father I thank you for these men, brothers, fellow warriors. Father, thank you that together, and I need them, that together you’re bringing about your kingdom. We long for the day when we sit in your presence, giving you honor and glory, for Jesus, for the cross, for the life that you’ve given us to spend, how grace has set us free to give ourselves away. We pray, Lord, that you would help us to hear your voice as sons and leaders, but also warriors, and we commit today and tomorrow and until you come back king Jesus, we commit it to you, for we pray these things in your strong, and holy, and gracious name. And all God’s men said, amen! Great word to pass on.